The iPhone 3G S shipping later this week includes a built-in digital compass. If you covet that compass but prefer to keep your existing iPhone, Compass Go could do the trick. East, West, Home’s Best: Use Compass Go to find your way back to a parking spot, campsite, or other hard-to-find locale—provided you remember to launch the app before you left. 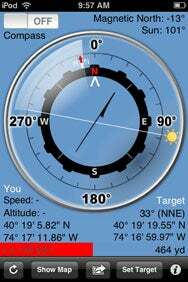 The $2 app from Tommy Westerberg lacks some of the visual polish we’ve seen in demos of the iPhone 3G S’s compass, but it certainly gets the navigation job done. You’ll need an iPhone, however, for this app; Compass Go is a no-go on the iPod touch. Compass Go works when you’re outside, and it’s meant to help you find your way back to a point that a map wouldn’t be useful in finding. So if you’re terrible at remembering your parking spot, or if you’re wandering aimlessly through a forest, that’s where Compass Go comes in—if you remembered to launch it before you got lost. When you launch the app, you tap “Set Target” so the compass can figure out where you are. Then, get lost. When you’re ready to return to your starting point, Compass Go can direct you back to your original precise longitudinal and latitudinal coordinates. You can also choose to enter in target coordinates to be directed toward, which should appeal to geocachers. Compass Go smartly features one-tap access to mail your current coordinates to a friend and to switch to the Maps app to see your location there. Relying on your iPhone as a compass is certainly a novelty; I’d prefer a cheap, manual compass were I to be dropped in the middle of nowhere sans map. Still, if you have an iPhone, Compass Go is fun for the wow-factor alone. Compass Go is compatible with any iPhone running the iPhone 2.2 software update.